Malaysian cooking was a mystery to me. The country is a dynamic blend of cultures: half Malay with the rest mostly Chinese and Indian. Over the years their cuisines have mingled, creating fantastic flavors but making it difficult to distinguish traditional Malay cuisine. 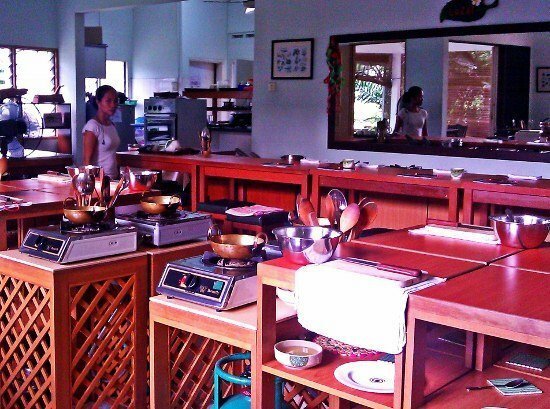 LaZat Cooking School offers a variety of hands-on classes that showcase many facets of Malaysian cooking. Located in a suburban Kuala Lumpur house, the school’s customized classroom is divided into two sections: a demonstration counter and individual cooking stations. Each class holds a maximum of ten students, which allows the two instructors ample time to spend with each student. Modern kitchen with 10 cooking stations at the LaZat Cooking School. The class was set up as a series of brief demonstrations followed by hands-on time at our own cooking stations. I like this type of class best since you can try out what you’ve learned while it’s still fresh in your mind. Everyone has their own station so each student makes every dish. Sue adds fritters to the palm oil. 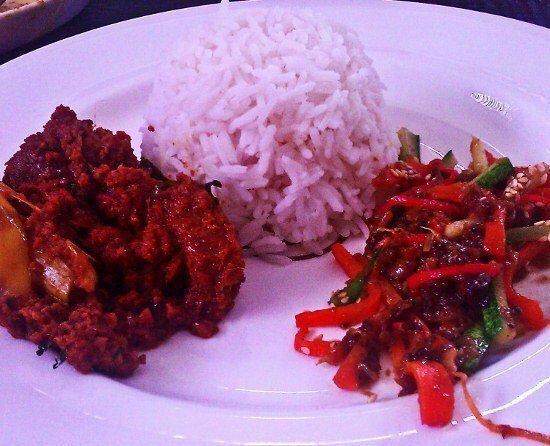 Next came the beef rendang, known in Malay cooking as “a festival dish” that is served on holidays. 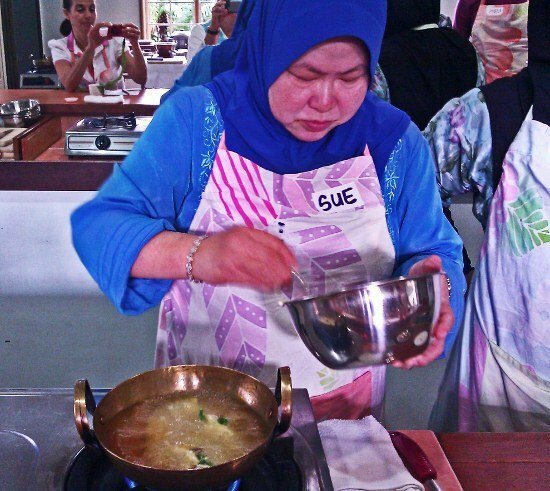 Every Malay cook has a unique recipe, and each cook is convinced that hers is the best. Rendang is a stew prepared with chilies, onions and other condiments, sweetened with coconut milk and served either wet or dry according to preference. Rendang is similar to an Indian or Thai curry, but not the same. Aromatics including lemongrass are sautéed with spices and then the meat and water are added to simmer. 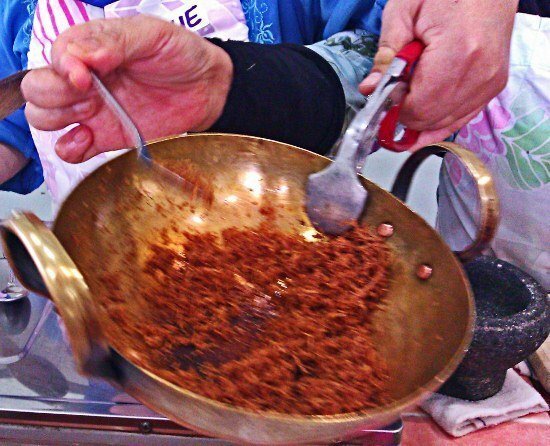 Saadiah explained that the signature ingredient here is coconut that is toasted and ground before adding to the stew. It adds a unique nutty flavor and serves to thicken it slightly. Keep swirling the pan so the coconut doesn't burn. Coconut milk is added near the end to give the rendang a creamy consistency. In this class we used a beef tenderloin which cooks quickly, however home cooks often use tougher cuts of meat that need more time to tenderize. Ironically, these less expensive meats make a more flavorful rendang since the ingredients are given more time to meld. While our rendang was simmering, we made our dessert. Kueh koci are a Malay take on truffles: sweetened coconut enrobed in a rice dough instead of chocolate. We melted chunks of palm sugar in coconut milk and added shredded coconut to make the candied center of the “truffle.” Rice flour mixed with water formed dough that we wrapped around our coconut. 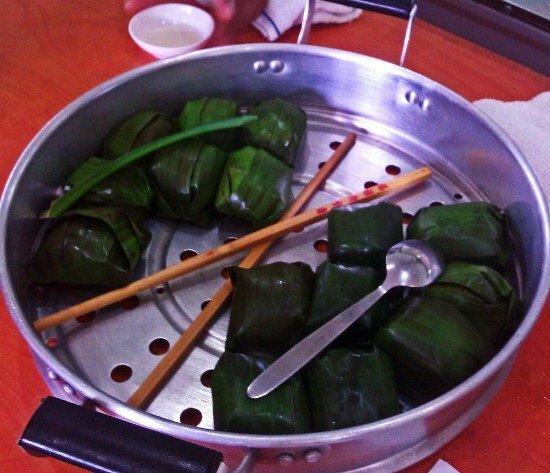 We wrapped them in banana leaves and set the pretty little packages in the steamer to set the rice dough. Kueh koci ready for the steamer. It was time to eat, so we quickly composed our Acar Timun, a warm salad of flash-sautéed vegetables that we dressed with a sweet/tangy dressing and garnished with sesame seeds. This recipe was Saadiah’s own, developed when she was a chef at a resort on the Malaysia coast. She said it matter-of-factly, but a sparkle in her eyes revealed she was very proud of it (the secret ingredient is shrimp paste). By now the rendang had reached its desired slightly dry consistency and our little coconut desserts were steamed. We sat down to taste the fruits of our labors, accompanied by the traditional plate of steamed rice. The rendang and salad were delicious, familiar flavors mixed in new combinations that snuck up on my taste buds. I loved how the toasted ground coconut both thickened and flavored the rendang. The warm salad had a pungency and crunch that contrasted perfectly with the stew. The coconut dessert was tasty, but I can’t say I really liked the glutinous rice coating—perhaps it’s an acquired taste. If I made the dish again I’d simply leave the glutinous rice out and steam the sweetened coconut alone in the banana leaves. 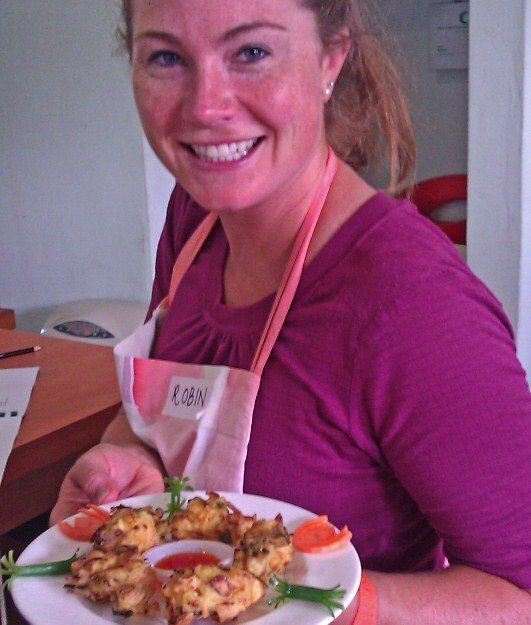 Classmate Robin shows off the prawn fritters. 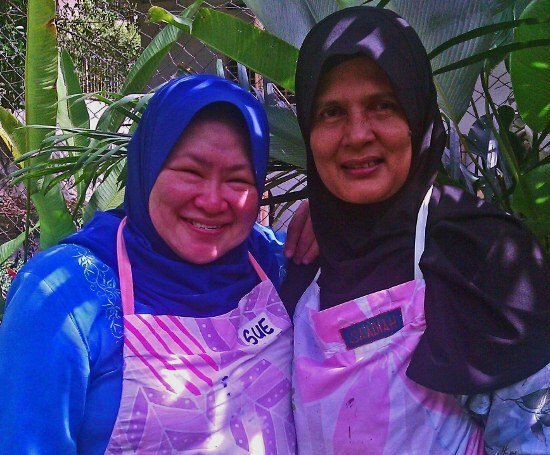 I had set out to learn about Malay culture via the kitchen. As I sat in the garden under a palm tree in suburban Kuala Lumpur, Saadiah tasted my rendang and pronounced it authentic. I beamed with pride, a Malay-for-a-day, and dug into my meal. *Please note for my gluten-free friends that this is a celiac-friendly menu. Chef Saadiah with her assistant Sue after another hot day in the kitchen. 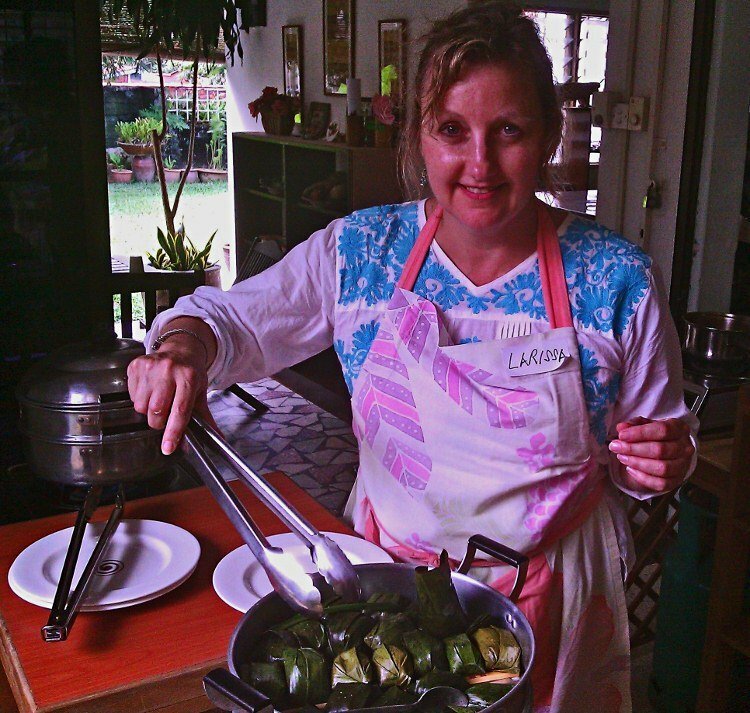 Click the link for more information about the LaZat Cooking School. For another cooking class, click to the link to learn how to make pasta. Previous post: How you can travel for a year: What does it cost?